You may have played this fun card game before, but do you know all of the official game rules for how to play UNO? How about playing with a point system? Challenging your opponent’s honesty?! This card game may seem straight-forward, but under all those evil “Wild Draw Four” cards there is a game of many variables and options, giving you a plethora of ways to play UNO. Let’s go over some of the official game rules for UNO! This card game is meant to be played by 2-10 players, ages 7 and over. Each player is dealt 7 UNO cards, face down, and the rest of the UNO cards are put in the middle of the players, also face down. A card is taken from the top of the pile, and set face up next to the pile, designating it the “discard pile.” The idea of the game is to match up cards from your hand to the discard pile, and be the first to be out of cards and yell “UNO!” right in your opponent’s smug faces. Once everyone has been dealt UNO cards, the question of “who starts?” comes up. If you want to play with official rules and not have a fight every time you start a new round of UNO, the first player to play will be the one to the left of the dealer. Since the first person to play is pretty arbitrary, you can make up your own rules for this: the youngest person starts the game, roll dice and see who gets the highest number, etc. To be eligible to play the Wild Draw Four card in UNO, you must not have any cards you can legally play in your hand. If another player challenges you, you must show your hand to all players. If you are a liar, you must draw 4 cards. If the challenger is wrong, they must draw 6 cards! There are many ways to score UNO; if playing a quick game, you can simply choose rules that apply to your particular round of UNO. The ultimate goal of UNO is to be the first person to play all of the cards in their hand and be “out,” so one example is to score it based on how many times a player has gone “out.” Arguably the most important thing to remember at this point is to say/yell/roar “UNO!” when you put down your second-to-last card. If you don’t do this, and another player catches you, you will have to draw 2 cards! UNO is essentially a game of strategy and screwing people over, but it’s fun and can be played in a variety of ways, making it a great card game for get-togethers. If you can get through a game of UNO using official game rules with your friends, family, or significant other and still speak to them afterward, that is a successful game of UNO. 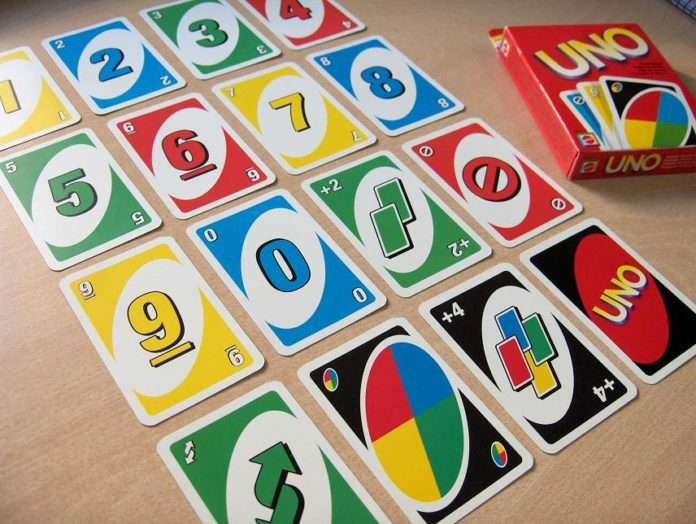 Along with the “normal” way to play UNO (with a basic UNO deck), there are countless other games that are exciting off-shoots of the original. The UNO Wild Jackpot Game uses customizable rule cards and the “Wild Roller” (a little slot machine that spins to reveal the next move) to add some interactive fun. The UNO Roboto Game comes with a robot that can record voices, and decides which player goes first and which player is going to quack like a duck (or whatever other wacky stunt you come up with!). Another option is the UNO Spin Game, where a spin of the UNO wheel can change the course of the game! What is your favorite way to play UNO?